Supervisory Control and Data Acquisition (SCADA) systems are fundamental tools for quick fault diagnosis and efficient restoration of power systems. When multiple faults, or malfunctions of protection devices occur in the system, the SCADA system issues many alarm signals rapidly and relays these to the control center. The original cause and location of the fault can be difficult to determine for operators under stress without assistance from a computer aided decision support system. In cases of power system disturbances, network operators in the control center must use their judgement and experience to determine the possible faulty elements as the first step in the restoration procedures. If a breaker or its associated relays fail to operate, the fault is removed by backup protection. In such cases, the outage area can be large and it is then difficult for the network operators to estimate the fault location. Multiple faults, events and actions may eventually take place with many breakers being tripped within a short time. In these circumstances, many alarms need to be analysed by the operators to ensure that the most appropriate actions are taken . Therefore, it is essential to develop software tools to assist in these situations. 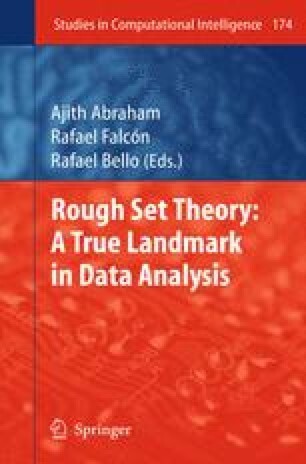 This chapter proposes a novel and hybrid approach using Rough Set Theory and a Genetic Algorithm (RS-GA) indexrough hybrid to extract knowledge from a set of events captured by (microprocessor based) protection, control and monitoring devices (referred to as Intelligent Electronic Devices (IED)). The approach involves formulating a set of rules that identify the most probable faulty section in a network. The idea of this work is to enhance the capability of substation informatics and to assist real time decision support so that the network operators can diagnose the type and cause of the events in a time frame ranging from a few minutes to an hour. Building knowledge for a fault diagnostic system can be a lengthy and costly process. The quality of knowledge base is sometimes hampered by extra and superfluous rules that lead to large knowledge based systems and serious inconveniences to rule maintenance. The proposed technique not only can induce the decision rules efficiently but also reduce the size of the knowledge base without causing loss of useful information. Numerous case studies have been performed on a simulated distribution network  that includes relay models . The network, modelled using a commercial power system simulator; PSCAD (Power Systems Computer Aided Design)/EMTDC (ElectroMagnetic Transients including DC), was used to investigate the effect of faults and switching actions on the protection and control equipment. The results have revealed the usefulness of the proposed technique for fault diagnosis and have also demonstrated that the extracted rules are capable of identifying and isolating the faulty section and hence improves the outage response time. These rules can be used by an expert system in supervisory automation and to support operators during emergency situations, for example, diagnosis of the type and cause of a fault event leads to network restoration and post-emergency repair.